On March 2-5, 2019, Crown Goose showed its beauty at 2019 International Home + Housewares Show. Chicago IHHS is one of the top three consumer goods fair. 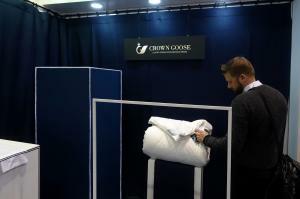 CHICAGO, ILLINOIS, USA, March 18, 2019 /EINPresswire.com/ — On March 2-5, 2019, Crown Goose showed its beauty at 2019 Chicago International Home + Housewares Show (IHHS). 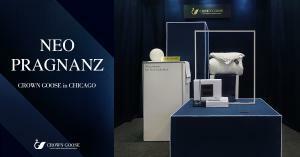 Chicago IHHS, which started in 1939, is one of the top three consumer goods fairs (Germany -Ambiente and Hong Kong- Hong Kong Houseware Fair). About 2,000 companies from 43 countries around the world participated this year. 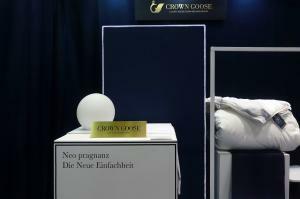 Crown Goose presented the art project 'NEO PRAGNANZ' (new simplicity) with a different concept and was recognized for its unique identity 'new and fresh'. It proposed a new concept of space art that reinterprets Gestalt theory in Crown Goose’s perspective. The main director of the Crown Goose Global Art Foundation Team explained in his introduction that "We have taken the visual stimulation uncritically, explored the human visual instinct to reconstruct sensory information as a consistent image”. During the show, Crown Goose was praised for its deepened philosophical insight into the art world and human psychology, as if the show participants are seeing admired piece of art. . Beyond simply purchasing a product, Crown Goose Global shares a lifestyle and culture that allow clients to experience art, tradition, and future-oriented values through five senses to deliver luxurious value. Through various collaborations with celebrities, artists, 5-star hotels, and luxury brands, Crown Goose is known for providing the best for its clients. In addition, the brand hosts private events and promotions for top 1% VVIP customers. Furthermore, Crown Goose’s exhibition of its collaboration with Swarovski, 'Overlap of Meaning', a crystal art bedding, caused a stir in the auction industry. Crown Goose’s private and personal custom goose down production service for the prestige clients, Crown Bespoke Service, had its collaboration with a Major League player Shin Soo Choo from Texas Rangers. Recently, the brand also participated as the official sponsor of 2019 Pre-Oscar Party. This opportunity provided not only the brand with quality time, but also gave the celebrities and artists some time to discuss about upcoming projects. Actors, musicians, and many other artists who inspired Crown Goose, and artists who are inspired by the brand, Crown Goose will always show respect and support for who are here to build a new era of art. This year, Crown Goose has set out to become a global luxury brand.